By G. J. Graves, Newcastle, California. The history of nitroglycerin and the Central Pacific Railroad is an interesting one, as much has been made of the many workers killed using this new explosive in the building of the Pacific Railroad. Nitroglycerine was invented in 1846 by Ascanio Sobrero, Albert Nobel designed a blasting cap that made use of the explosive almost safe in 1865, and in 1867 Nobel mixed silica and nitroglycerine, making dynamite. Prior to 1867, nitroglycerine was shipped as a liquid; the first known specimen of this liquid was reported in California on April 21, 1866, in a newspaper article in the Placer Herald, Auburn, California. "On Monday, 16th inst., in San Francisco, at fifteen minutes past one o'clock, P.M., an explosion took place in the storeroom back of Wells, Fargo & Co.'s building, in G.W. Bell's assay office, adjoining California Street, which demolished everything with a circuit of 40 or 50 feet, including the whole interior of Bell's assay building, the storeroom and west portion of Wells, Fargo & Co.'s building, the back portion of the Union Club Rooms, and other apartments in the vicinity. The explosion was powerful as to shake the earth like an earthquake for a circuit of a quarter of a mile. Every window in California Street, between Montgomery and Kearney, was demolished, and panes of glass were shattered ever as far as Third Street, a distance of half a mile. For some time after the explosion it was impossible to tell the cause of the calamity. Some asserting that it was a barrel of acid in the Assay Office; others said it was a steam boiler in the rear of the office; and others, that it was some kind of explosive material stored in the yard of Wells, Fargo & Co. It has since been ascertained to have been caused by Nobel's blasting oil, or nitro glycerine, a new explosive five times more powerful in its effects than powder. A box containing this liquid had arrived by steamer from the East, and when landed upon the wharf was found to be in a leaking condition. It had been shipped as general merchandise, and none were aware of the dangerous contents of the box. It was sent to the office of Wells, Fargo & Co. and placed in the rear of the building, among the unclaimed freight, where Mr. Webster, the freight clerk in the New York department of the Express office, and Mr. Havens, freight clerk of the Pacific Mail Steamship Company, went to examine that in connection with another package claimed to be in a damaged condition. The last seen of these gentlemen alive, they were standing near the box, with several other employees, having tools as if about to open the box. It is supposed they made the attempt, when the explosion took place by concussion, which resulted in a terrible loss of life and destruction of property. RESULTS OF THE EXPLOSION IS EXTREMELY GRAPHIC. 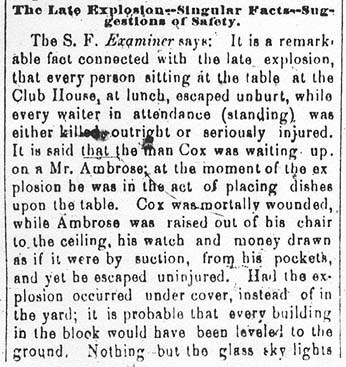 There was not a whole window for a long distance from the building in which the explosion took place, and in Brannon's block, opposite Wells, Fargo & Co.'s on Montgomery street, the Stevenson House, opposite, and in many building between California and Sacramento streets window frames and doors were generally shattered to fragments, while huge splinters of costly plate glass covered the streets. Fragments of human remains were found scattered in many places. In the auction room of Cobb and Sinton, on the east side of Montgomery Street, a human brain, almost intact, and other fragments of the body near it, were found. A piece of human vertebrae was blown over the buildings on the east side of Montgomery Street, where it was picked up in front of Squarza's, on Leidsdorff street. A piece of skull was lying on California Street, east of Leidsdorff, with other fragments of human remains, and a human arm struck the third story window of the building across the street." This newspaper story continues for many more paragraphs, describing the dead, the living and the names of the victims. The story ends thus: "This must be stopped at once ... There must be a total discontinuance of the practice of carrying suspected packages under term 'merchandise.' Public safety demands it." Three weeks later, Wells, Fargo and Co. printed a notice that it would no longer carry nitroglycerine in its coaches. Beginning in January, 1867, the "Associates" began discussing the use of nitroglycerine in their internal correspondence, as they were concerned about paying for the use of the patent which E.B. Crocker wanted to buy, as the stuff could then be sold to others. One of the early concerns was that the Vulcan Powder Co. had been formed with the expectation of buying the California rights to the patent. We know from the report from John Robert Gillis entitled "Tunnels of the Pacific Railroad" that English chemist James Howden established a nitroglycerine factory at the West end of Donner Lake, Cal., as Mr. Gillis writes: "Nitro-glycerine, was introduced on the work early in 1867, to expedite progress of the Summit Tunnel. It was made on the spot by Mr. James Howden, and used in the four headings of tunnel No. 6 <Summit Tunnel> from February 9th, and to some extent in tunnel No. 8, but not enough data for comparison. After the headings of these tunnels were through, it was used on the bottoms." Court cases describe the factory as being "at Donner Lake" likely meaning somewhere between the Lake the Summit Tunnel. E.B. Crocker wanted to control the right for the Central Pacific Railroad to make all they could use but indicates in a letter to C.P. Huntington in July, 1867, he thought it would be well to control the rights in California, Nevada and Idaho. At that same time, Charles Crocker said he did not intend to use it on "outside blasting" but E. B. Crocker thought that Charles was wrong in that restriction. All side hill blasting followed the instructions of Charles Crocker, however, as black powder was used solely for all side hill explosions. Collis P. Huntington was advised by E. B. Crocker that the man who owned the patent rights in the U.S. had concluded to sell the rights west of the Rockies to an unnamed party, and after it had been determined that the Central Pacific was manufacturing nitroglycerine without any legal right to do so, this sale fell apart as patents were not being enforced. The owner of the patent then demanded $2,000 in damages from E. B. Crocker, however Mr. Crocker offered only $500 in gold, and that settled the matter. That the Central Pacific was using the patent illegally is seen in the court case of "Giant vs. Vulcan Powder Co." which is quoted thus: "It [nitroglycerine] assisted in solving one of the greatest engineering problems of the age—that of building the [Central Pacific] railroad over the Sierra Nevada Mountains ... the railroad used it in its liquid state long prior to the dynamite patent  and in fact they never did use it except in that way. ... This discovery [of Nobel's] that nitroglycerine could be detonated was worth millions of dollars to that one corporation." Much has been said of the many deaths of the workers on the Central Pacific Railroad. In scanning newspaper reports for the years 1863 through 1867, this writer has found but a half dozen reports of fatal accidents, involving fewer than 20 men, these deaths were equally shared between Chinese and Caucasian workers. Gillis mentions but 2 accidents in the tunnels, and does not blame nitro glycerine for the errors. Howden dismantled the nitroglycerine factory upon completion of Tunnels 6 and 8, and nitroglycerine was not used again for these reasons: (1) Charles Crocker gained complete control of construction East of the California line under the auspices of "The Contract & Finance Co." and he was not in favor of nitroglycerine; and, (2) the expense the Central Pacific Railroad would have had to pay for the patent did not extend beyond use of nitroglycerine in the tunnels, as black powder could be purchased from the manufacturer without royalties paid to Mr. Nobel or his U.S. representatives. Van Gelder, Arthur Pine, and Hugo Schlatter. History of the Explosives Industry in America. New York, Columbia University Press, 1927. The Collis P. Huntington Papers, 1856-1901. California State Library. Placer Herald, Auburn, California, April 21, 1866.